Nearly nine months after Hurricane Maria, government officials have not accounted for all hurricane-related deaths. Hispanic members of Congress on Wednesday called for an independent commission to investigate how deaths have been counted from Hurricane Maria and whether underreporting in the immediate aftermath slowed Washington's response. The call comes as the Puerto Rican government and the Trump administration are facing a backlash over the death count from the hurricane after a recent Harvard study estimated that it could surpass 4,600 — more than 70 times the official death toll of 64. Members of the Congressional Hispanic Caucus argued at a news conference Wednesday that inconsistent death estimates led President Donald Trump to celebrate his administration's response to Hurricane Maria when he visited the island two weeks after the storm hit. Trump suggested that it wasn’t “a real catastrophe" like Hurricane Katrina in 2005 because the official death toll at the time of his visit was only 16. 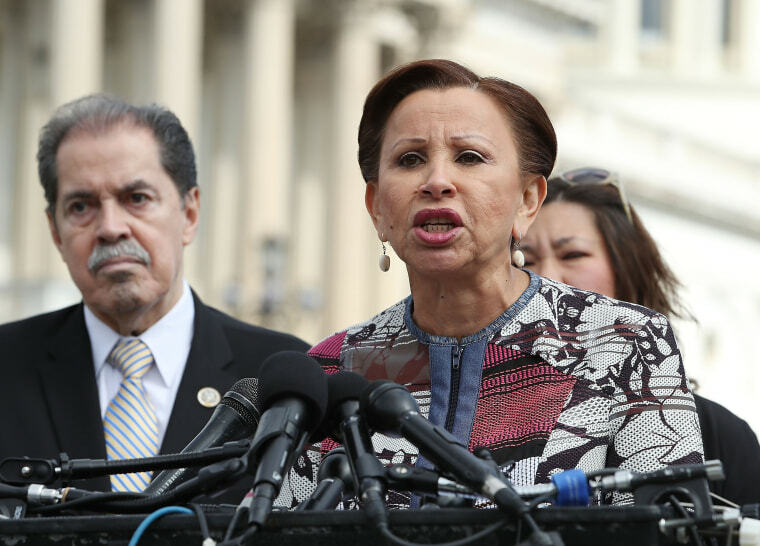 Rep. Nydia Velázquez, D-N.Y., said she was calling for an independent commission "similar to what we had in 9/11 to examine the death toll, the federal response and how federal agencies such as FEMA may have responded sluggishly based on artificially low numbers." FEMA said "the insinuation that federal response has been lacking is absurd," calling its response "historic" in a statement to NBC News. Some of the aid from FEMA included more than $1.3 billion in support to survivors, a 62-day mission to provide food and water, and the installations of 2,193 generators, among other efforts, the agency said. FEMA also emphasized that the agency "is not a first responder" and clarified that "the actual counting of disaster-related fatalities is the responsibility of local jurisdictions, not FEMA." At the news conference, Rep. José Serrano, D-N.Y., emphasized that when accurate numbers are not made public, it’s hard to measure a disaster’s full scope. Federico De Jesús, from Power4Puerto Rico, a coalition that advocates for the island's recovery, reminded attendees of the need to increase data access and transparency in Puerto Rico to come up with effective emergency response plans. The news conference came after a judge this week ruled in favor of Puerto Rican journalists from the Center of Investigative Journalism and CNN who sued the island’s government over the release of death certificates. Judge Lauracelis Roques Arroyo ruled that "the death certificates and the additional information requested by the plaintiffs are of public nature" and should be released, with the exception of social security numbers. "The state does not have a compelling interest to justify denying access to them,” the judge ruled. In a statement, Puerto Rico’s Secretary of Public Affairs Ramón Rosario suggested that the administration of Gov. Ricardo Rosselló plans to comply with the judge’s order. The minority leader of Puerto Rico's Senate, Eduardo Bhatia, called the decision "marvelous” in an interview with NBC News. “I don’t think people realize how poisonous this can be," he said. Days after a commencement speech at his alma mater, Princeton University, Bhatia said some people in Puerto Rico have "shock syndrome." Eduardo Bhatia, minority leader and former president of the Senate of Puerto Rico, addresses members of Princeton's Class of 2018 on Sunday, June 3. Bhatia is a 1986 alumnus of Princeton. The Rosselló administration is facing at least one other lawsuit over public death count data. Puerto Rico's beleaguered Institute of Statistics (PRIS) filed a lawsuit on Friday to order Puerto Rico’s Secretary of Health Rafael Rodríguez Mercado and the Director of the Demographic Registry Wanda del C. Llovet Díaz to urgently comply with an information request order from the Institute put forward in April 24. The request urges both public officials to publish in an open source way preliminary and daily updates about deaths in Puerto Rico. PRIS has clashed with the Rosselló administration for nearly a year over its decision to strip it of its independent status and consolidate it under a government agency, despite entreaties from scientists, statisticians and bipartisan members of the U.S. Congress. Just hours after the PRIS’s lawsuit was filed, Puerto Rican officials released part of the public mortality data many have spent months trying to obtain. However, such actions do not change the nature of the lawsuit. “The case presented by the institute will continue to move forward, as the information request from the institute is related to individual information about each death, information that has not been made available yet,” said Mario Marazzi, PRIS's executive director, in a statement. Hurricane season already started in Puerto Rico and more than 10,000 households in the island still have no access to electricity nearly nine months after Hurricane Maria.